Support HAF by purchasing this kid-friendly cookbook! Keiki in the Kitchen with Mika the Sous Chef features 39 keiki-friendly recipes contributed by Hawaiʻi’s top chefs whose restaurants participate in HAF’s annual Localicious Hawaiʻi public awareness initiative, which recognizes restaurants that support Hawaiʻi’s local farmers, ranchers and fisherman and their contribution to HAF’s ag education programs in Hawaiʻi public schools. All the recipes in the book incorporate at least one local product. 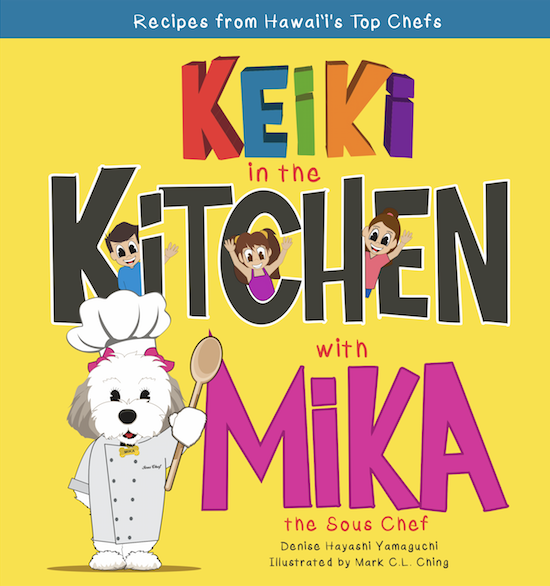 Keiki in the Kitchen with Mika the Sous Chef begins with Mika’s Ag Adventure and follows Mika the Lhasa Apso as she takes children on a journey to learn all about healthy eating habits, the importance of buying local ingredients and where food comes from by visiting a farm, the fish auction and a ranch. Kids will be inspired for any meal of the day with delicious recipes like Breakfast Bruschetta by chef Lee Anne Wong of Koko Head Café for breakfast, Rainbow Waldorf Quinoa Salad “To Go” by chef Ronnie Nasuti of Tiki’s Grill & Bar for lunch, Kālua Pig Quesadilla with Avocado Cream and Pico de Gallo by chef Russell Siu of 3360 on the Rise for dinner and Avocado Chocolate Mousse by chef Jasmine Silverstein of Sweet Cane Café for dessert. Families with dogs can also enjoy a few dog-friendly recipes for Mika’s favorite home-cooked meals by chef Roy Yamaguchi such as Plantation Chicken and Okinawan Sweet Potato Stew! Order your copy now for $19.99 plus tax, shipping and handling. All proceeds benefit HAF.